Great. So he’s driving a car with a faulty radiator, and he can’t get his cell phone to work. This alone doesn’t suggest the most responsible driver on the planet. But what Dombowski didn’t explain was why he was apparently so drunk, he didn’t think twice about swigging Scotch in front of a cop, allegedly cursed the cops out, resisted arrest, and kept yelling about “bleeping” killing someone who wasn’t there. So Dombrowski, as we say in the journalism business, buried the lead. It’s a very good thing Cabrera didn’t report to camp today, because if he had, even the most die-hard Tiger fan might have had a problem with such obvious star treatment. I understand why his Tigers teammates say they’ll welcome him with open arms – there is a code in the locker room after all – but you wonder if they would welcome someone else with open arms if that person had just drunkenly plowed into their wife’s vehicle. 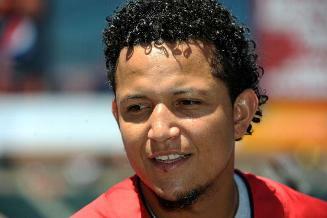 Because that’s who Cabrera was Tuesday night. The guy who plows into your wife’s car, your friend’s car, your son or daughters car. Drunk is bad enough. Drunk behind a wheel is a pure menace to society. There should be no excusing that. No sugarcoating it from the Tigers. They need to take a stand about the driving thing as much as they do about the drinking thing. They cannot embrace this loving, family, wrap-your-arms-around-poor-Miguel thing when he clearly, willingly, got behind a wheel while either drunk or in the process of getting drunk. Really? Just so happened? I don’t buy it. But if it truly was, then what on earth happened en route to camp that made him so incredibly irresponsible? Until the Tigers have that answer – more importantly, until Cabrera has it, and accounts for it, and gets help for it – he should not see the inside of a stadium. Not a spring training one. And not Comerica Park. This entry was posted on Saturday, February 19th, 2011 at 7:15 pm and is filed under MLB. You can follow any responses to this entry through the RSS 2.0 feed. Responses are currently closed, but you can trackback from your own site.